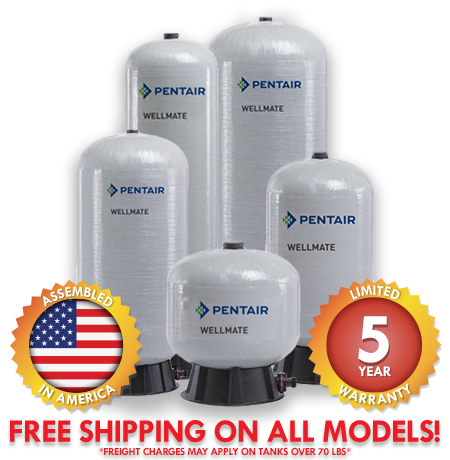 These rustproof WellMate pressure tanks are made with blow molded, fiberglass wrapped, seamless construction. They won't rust, dent, or come apart at the seams because there are no seams, and a rugged base is included. Full five-year limited warranty. These tank now features the quick connect that snaps securely into place and is retained by an H-clip. WM-10LP 24" X 28" 35 gallons 10.7 gallons gallons 1" NPTM 36 lbs. WM-6 16" X 32" 20 gallons 5.9 gallons 5.1 gallons 1" NPTM 19 lbs. WM-9 16" X 44" 30 gallons 8.9 gallons 7.7 gallons 1" NPTM 31 lbs. WM-12 16" X 57" 40 gallons 12.2 gallons 10.5 gallons 1" NPTM 29 lbs. WM-14WB 21" X 41" 47 gallons 14.1 gallons 12.2 gallons 1 1/4" NPTM 48 lbs. WM-20WB 24" X 42" 60 gallons 18 gallons 16.2 gallons 1 1/4" NPTM 55 lbs. WM-25WB 24" X 55" 87 gallons 26 gallons 22.5 gallons 1 1/4" NPTM 82 lbs. WM-35WB 25" X 75" 120 gallons 34.2 gallons 29.6 gallons 1 1/4" NPTM 121 lbs. CH3133-2 for WM-6 gallons gallons gallons lbs. CH3134-2 for WM-9 gallons gallons gallons lbs. CH3135-2 for WM-12 gallons gallons gallons lbs. CH4466 for WM-14WB gallons gallons gallons lbs. CH4846 for WM-20WB gallons gallons gallons lbs. CH4467 for WM-25 gallons gallons gallons lbs. CH4468 for WM-35WB gallons gallons gallons lbs.